Our closed-loop water recycling and closed-loop alkaline recycling systems have saved a number of our clients significant time and money while improving their processes and quality control. The case studies below provide a helpful analysis of some relatively common problems and the efficient, cost-effective solutions that helped solve them. (PDF) "Clean Break from CFCs"
(PDF) "Encouraging Water and Energy Conservation: Driving Forces"
A Closed-loop chemical recycling system not only improved product quality and lowered costs for a company-it won their team of engineers an award. The six engineers of the "Stain Team," headed by Tim Keiper of Instrument Specialties Company Inc (Delaware Water Gap, Pa), earned the company's Continuous Improvement Pioneer Award after reworking their cleaning operation to include an AquaChemical TM AC002012 recycling system from Separation Technologists, Inc. (Methuen, Mass). One process conducted at Instrument Specialties is a degreasing operation, where parts are cleaned prior to electroplating. The parts themselves are beryllium copper strips used in shielding equipment for computers and other electronic devices (figures 1 & 2). The parts washer runs at a temperature of 170 degrees F. The contaminants being removed from the parts include water-soluble stamping oils, suspended solids, and metal particles. Prior to implementing the new recycling system, a coalescer and skimmer were the only oil removal methods used in the operation. The company used a chemical cleaner to remove oil from the parts. A problem arose when small amounts of oil were detected on the parts after cleaning, which led to quality issues. The team of engineers researched and installed the Aqua-Chemical membrane-type, closed-loop chemical recycling system to remove the contaminants and then concentrate them for disposal. The Stain Team expected to improve product quality, which was the initial goal. But in achieving that goal, they realized significant other benefits as well. Prior to purchasing the recycling system, Instrument Specialties employed a cleaning operation whereby 600 gallons of cleaning solution was changed every two to three days; this was done in an effort to maintain quality. Despite these efforts, spotting continued to be a substantial problem, creating bare spots and poor adhesion. Indeed, it was the key cost factor in postcleaning plating part failures. The company paid a high cost for their inefficient cleaning system, not only in terms of buying new chemicals, but in waste haulage and disposal. And, even with all the changeover and expense, the desired quality still wasn't being achieved. The Stain Team began by working with Separation Technologists to examine the full scope of the problem and find its cause. A pilot study was conducted on the cleaning solution used in Instrument Specialties' operation. Results suggested several problematic facets-not only in the chemistry, but in the entire cleaning process. Neither the coalescing nor the skimming mechanism was capable of removing significant amounts of the emulsified oil from the cleaning system. The oil could therefore redeposit on the parts. The research team determined that installing the AquaChemical recycling system would solve this problem. The emulsified oil could be easily removed by mechanical means- without using special chemicals to achieve oil separation. The Stain Team, in conjunction with Separation Technologists and a new chemical supplier Matchless Metal Polish, developed an alternative cleaning solution for use with their prospective recycling system. The new chemistry, could be close-loop recycled to remove the free and emulsified oil that lingers on parts after washing. This new cleaning chemistry (Matchless Metal Polish, SC-114-L) is a milky alkaline, highly wetted, liquid non-stretch soak cleaner that is effective as both a soak and an ultrasonic cleaner. It effectively removes oil and soil from aluminum, zinc die-castings, brass, and steel without attack on the base metal and can be used in soak tanks, agitating parts washing equipment, and ultrasonic units. It is compatible with microfiltration and boasts a wide operating temperature range. The new chemistry has very free rinsing properties and a high soil tolerance. Its mild alkalinity also prevents parts from discoloring. The new solution is more potent, resulting in better cleaning effectiveness, and demonstrates a 35% reduction in comparable cost over the old chemistry. Currently, the concentration of the cleaner ranges from 2% to 5%, and 0.3 gallons of chemistry are added on a daily basis to makeup for chemistry dragout and undesired membrane removal of some of the cleaning chemistry. The membranes are cleaned every alternate day and have never been replaces in nearly one year of operation. Reductions in chemistry use, physical labor, waste disposal, and product rejects have led to an annual cost savings of almost $120,000. The typical components of the waste stream include water-soluble oil and suspended solids, which are hauled away for disposal. The changeover of cleaning material, which was every two to three days, has become once every six to eight weeks. During changeovers, the 600 gallons of used cleaning solution is evaporated, and the concentrate is hauled away along with the remaining waste oil. This considerable extension in working time means tremendous savings in cleaning solution costs, since each batch has eight times the working life of the old. Similarly, haulage and disposal costs have been reduced proportionately, as has system maintenance. With continuous recycling, alkaline chemical spikes have been eliminated, resulting in a more consistent concentration of chemistry. The most significant achievement, of course, is the one first targeted by the Stain Team: a total improvement in the quality of cleaning for the finished product. "We are very close to a stain-free (defect-free) product," stated Keiper. "The reduction of downtime in the process has also helped in providing a benchmark of completely elimination stains in all of our products." The key to the Stain Team's success lies largely with their implementation of the AquaChemical technology and the Matchless Chemistry. The closed-loop, membrane-type system has proven a valuable means of extending the working life of the solution - and efficiently separating clean, usable solution - well beyond the limits of previous technology. It has also simplified the Instrument Specialties Company's operation. "Holding tanks have been added to stop the time-consuming transfer of used solution via drums, a time savings of approximately 75 percent," Keiper remarked. "The procedure is now automated, saving time and eliminating the chance of spillage." For more information about the AquaChemical system, or other closed-loop wastewater treatment, recycling, and purification systems, contact Separation Technologists Inc at (603) 898-0020, Fax (603) 898-4859. For more information about the Matchless chemistry, contact the Matchless Metal Polish Company at (800) 328-5436. In each of the below cases, manufacturing engineers including management lacking training in water, wastewater treatment, water recycling, and hazardous waste, made errors in their evaluations. The results were substantial engineering design team misapplications, inflexible designs, and the risk of subjecting their companies to serious unknown liability issues. Speak to a company like Separation Technologists that specializes in wastewater treatment to ensure the most effective design and solution. "If you're buying a cleaner from us, why not buy a closed-loop wastewater recycling system from us at the same time?" Discussion - One cleaner vendor supplied a complete cleaner and separate closed-loop WASTEWATER recycling system to each of two different customers in California. After the systems were installed, neither customers could get the systems to function as a closed-loop process. The incompatible soldering chemistries would not allow economical operation, and 30-60% of the water had to be dumped to drain. Lesson - The closed-loop wastewater recycling process is a chemistry-intensive operation. It may function in many cases without extensive knowledge of soldering chemistries, a prospective customer may have a complete failure. "We decided to buy a wastewater treatment system from the cleaner manufacturer because it was convenient." Discussion - The cleaner manufacturer bought the wastewater treatment equipment from another company. This company was actually reselling the equipment that was made by another company. Therefore, there were two companies between the end user and the actual manufacturer of the equipment. In addition, the company that made the installation was a different local service company. During the installation, hydrogen peroxide was used to disinfect the piping system. Excess peroxide was put into an empty drum that was located near the equipment. After a few hours, the drum, that now was inside a shed, exploded from the excessive build-up of gas from a reaction of the peroxide with an unknown organic compound that was inside the drum. The drum was projected through the roof of the shed and landed on the roof of the adjacent building a few hundred feet away. "We decided to buy the equipment from a smaller company that was offering a lower price." Discussion - After the equipment was installed, problems were encountered by both companies in a short time. Their solution became more difficult as time went on because of serious design deficiencies. In the subsequent months, service calls were unanswered and the small water treatment manufacturer went out of business (E, KT). Without being able to correct the problems, both companies had to purchase new equipment from another company. Lesson - Both companies knew that they were calling a supplier that only used an answering machine! This was a sure indication of the size of the company. Case #6: Large Midwestern Electronics Div. of a Transportation Co. uses a local regeneration company that mistakenly mixes water purification resin with lead treated resin. "I just called a local water treatment dealer and a salesperson came to discuss the application. He recommended his fiberglass tanks for my operation..."
Discussion - A manufacturing engineer contacts a major USA water purification company with a local regeneration dealership to get a DI water supply for his cleaner. The dealership is an independently owned franchise that does not handle wastewater treatment resins but typically only water purification applications for laboratories hospitals, or dialysis patients. He talks to the sales person and unknowingly does not discuss his lead removal application; in addition, the sales person does not ask the correct questions. The lead contaminated resin is now mixed undoubtedly with many other customer's resins. It is very important to realize that the generator (user) is still legally liable for any ultimate misuse of resin containing lead regardless who is at fault. Lesson - This is a case of how a manufacturing engineer who is not familiar with water treatment can allow himself to expose his own company to serious liability because he did not question the credentials of the vendor. If you do not know, the engineer should have spoken to a company that handles wastewater treatment applications and he would have avoided this problem. A world-class processor of titanium scrap had a wash system whose cleaning solution was becoming contaminated with both free floating unemulsified tramp oil and emulsified water soluble oil that was being washed off of titanium turnings. As the level of oil contamination increased over time in the wash solution, cleaning effectiveness diminished. The processor uses a metric, which they refer to as the "carbon number" for measuring their cleaning efficiency. It measures the amount of oil present on the titanium turnings after they are cleaned. The carbon number of the cleaned, recovered titanium turnings exiting the wash system worsened over time and the client wanted to eliminate this problem, which was associated with the critical measure of the end product quality. Subsequent rinses were becoming contaminated from the drag out of both types of oil, thus causing the discharge of rinse water to the local sewer to approach and, in some cases, exceed discharge limits. Ultimately, dumping the spent wash solution and recharging the wash tank with a fresh wash solution was the answer to these operational problems. However, this approach for servicing the wash tank was expensive. There were labor costs associated with dumping, cleaning, and recharging the wash tank. Dumping resulted in disposal costs for the waste wash water. Recharging the wash solution resulted in added chemical costs for new detergent and reheating the wash solution resulted in higher energy costs. Additionally, production was lost due to downtime for these wash tank services. The titanium scrap metal processor began a search for a better solution to the problems associated with the wash system. The objectives were to extend the useful bath life, reduce the wastewater volume generated, ensure the quality of the washed turnings exiting the wash system, and reduce the drag-out of oils from the turnings into the rinse water to help meet discharge regulations. They selected the AquaChemical Microfiltration System from Separation Technologists, Inc. to work in conjunction with the Suparator from Aqueous Recovery Resources, Inc. (ARR, Inc.) to accomplish these goals. The AquaChemical system employs a ceramic microfiltration membrane to filter and recycle aqueous alkaline cleaning solutions. The microfilter has a porosity of approximately 0.2 microns. The AquaChemical system removes emulsified oil from wash water, but is not designed to remove excessive quantities of free floating, unemulsified tramp oil, which is almost always present in these operations. These types of oils can reduce the AquaChemical system's throughput if not properly pretreated. A device called the Suparator, manufactured by Aqueous Recovery Resources, Inc., of Bedford Hills, NY accomplishes this objective very well by removing unemulsified tramp oil from the wash solution and enables the AquaChemical system to work at its optimum level. Suparator's unique technology exploits Bernoulli's Principle to scalp oils from a flowing stream of wash solution. In addition to being the only system in the world to strip oil from water without utilizing media of any kind, Suparator functions at an exceptionally low cost of operation. The Suparator system also produces a dry stream of recovered oil that is currently sold by the processor to a waste oil blender for approximately $0.40 per gallon, which further lowers the total cost of ownership for the pre-treatment system. ARR, Inc. has worked with several facilities that reprocess titanium and understands the very heavy dirt and oil loads that can come in with titanium turnings and chips. The wash solution for these materials can become saturated very quickly with these soils and rapidly becomes ineffective. Poor cleaning results in contamination being dragged into subsequent rinsing, melting, and forging processes. Increased contamination means the recycler receives a lower price per pound for the recycled materials. 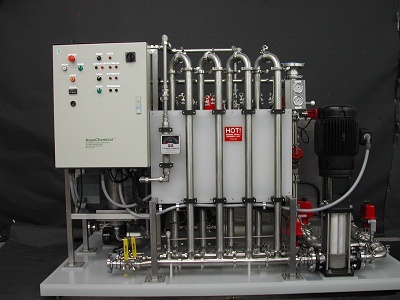 The AquaChemical microfiltration system employs a "cross-flow" type of filtration device. This differs from conventional filtration, such as cartridge or bag filters. With cross-flow filtration, the contaminated fluid flows across the filter media surface in a tangential direction. The filter media, or microfiltration membrane in this case, acts as a barrier to emulsified oil and suspended solids and rejects these species. The bulk flow sweeps the membrane surface clean and keeps these rejected contaminants from gathering on the microfilter membrane surface. This keeps the membrane surface relatively clean, allowing for consistently high rates of filtration. Also, cross-flow ceramic membrane filters do not require regular replacement. Typically, the membrane is washed, regenerated, and reused for periods approaching 5-10 years before replacement is needed. The Suparator skid includes a specially designed interface between the processor's primary wash solution tank and the Suparator skid, where the precision separation of oil and wash solution occurs. The solution is pumped from the solution holding tank to the Suparator skid, using a specially designed, non-mixing pump. At just 2 feet by 5 feet the unit was easy to install. Separation Technologists, Inc. worked closely with ARR, Inc. to develop a properly sized Suparator to handle the heavy dirt and oil load of the process. They selected the Series 84, Model 540 system, one of ARR's standard systems, that comes complete with its own pump and variable speed drive controller. By removing gross oils from the feed-stream before being pumped into the AquaChemical's process tank, the Suparator eliminates membrane fouling caused by unemulsified tramp oil. This important pretreatment step reduces degradation of the filtration rate that can cause the microfilter system to experience difficulties processing water with the level of unemulsified tramp oil contamination seen in chip washing and recycling facilities. By reducing the tramp oil loading from the wash solution before the AquaChemical microfiltration system processes it, the AquaChemical system can run longer between required membrane cleanings, thus substantially reducing the total waste volume generated by the processor. The oil-stripped wash solution from both the Suparator and AquaChemical systems is returned to the wash tank and continuously reused to clean new batches of titanium scrap. Total oil removal is critically important for the processor, as their final product is graded by carbon content. Carbon content, in this case, is due to residual oil contamination, so the lower, the better. The AquaChemical system itself is relatively easy to operate. The system consists of a process tank, a circulation pump, and a bank of microfilter modules. With fluid level indicators and switches in the process tank and a transfer pump connected to the wash system, the AquaChemical system can run continuously, 24 hours per day, 7 days per week, with minimal operator involvement. The microfilter membrane provides consistently clear filtered product water through the entire process, since it is a mechanical separation process, as compared with chemical treatment, which relies on a phase change to occur. This treatment approach allows water and soap to pass through the AquaChemical system's microfilter elements, while removing water-soluble oil and solids from the wash solution. Thus, the wash solution is filtered and reused, while the oil contaminants are removed from the wash solution. The result is that the processor is washing titanium turnings with a wash solution that is consistently better over the long-term than before, which has resulted in fewer interruptions and better carbon numbers for the recovered turnings from the wash system. The wash solution itself is cleaner, with regards to oil content; thus the rinse water has less oil content from drag-out than previously seen. The drying process now produces less smoke from oil residue burning; thus the working environment has improved, which was an unforeseen, but welcome improvement to the processing line. With the use of the AquaChemical and Suparator systems, the processor has significantly improved productivity, cut operating costs, reduced waste, and improved product quality from the washing operations conducted on scrap titanium turnings. Suparator is a registered trademark and is used with permission of Suparator International b.v.